This is about a woman who has a very successful blog and with some hard work and a publisher that believed in her had her first book published. And that woman isn’t me. I’m talking about Kris Bradley who created the blog Confessions of a Pagan Soccer Mom, who with Weiser Books published her first book “Mrs. B’s Guide to Household Witchery: Everyday Magic, Spells, and Recipes”. Obviously I despise this woman. Enough blither blather (Two words Microsoft Word acknowledges, I might add.) Let’s actually talk about Bradley’s book. 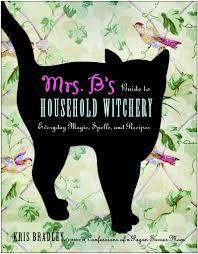 This one is truth in advertising, she has created a pretty sweet guide to household witchery. There is tons of information about household foods and spices, different magical blends you might consider for around the home (ranging from protection washes to prosperity oils), a review of deities and household guardians to consider for your home, a room by room magical tour of your home, and more. In fact, despite how much information there is to be found in “Mrs. B’s Guide to Household Witchery”, I almost wonder if it started out longer. Much longer. The book doesn’t feel cut off or abrupt. I just pick up a vibe that if let loose Bradley could have done a book that was twice as long, and for what it’s worth Weiser, I would not have minded at all.